I will always remember one of my favourite Christmas gifts that I've received so far as an adult. It was a gift that couldn't fit under a Christmas tree, that couldn't be wrapped, and that required skiing 11 km to enjoy. Given to my husband and I by his parents back in 2006, it's a pretty great gift if you still remember it 10 years later. We've also had family members buy us ski cards as Christmas presents and my father would buy us discount cards to every hill within a five hour drive of Calgary. It made skiing a LOT cheaper and we were very grateful for those cards. A Christmas Gift Could Give you THIS Great Experience! So, now I ask you, what would you like for Christmas? What lodge or resort have you been longing to visit? What tour have you been eyeing up? What bucket list item could a family member easily buy you as a present? Or, what could your spouse buy you that would make your favourite winter sport much easier to do this upcoming season? Where would you like to spend a weekend with the family this winter? Below are some suggestions to get you started with your holiday wish list. I hope they will also serve as inspiration if you're looking for ideas for that hard-to-buy-for spouse, outdoor loving parent, or child who has more than enough toys in the house! Choose one of these ideas for your brother, sister, best friend, or even your child's teacher at school if you're working together on a class gift. If you're immediately thinking that you don't want to spend Christmas away from home, don't worry because I don't either! What I'm suggesting is that you plan a weekend away for the family sometime in the new year. Book a couple of nights at your family's favourite mountain hotel (perhaps a resort you've always wanted to stay at,) and brainstorm some fun activities you'll do while there. Then, you buy a calendar. You write the date of the trip on the calendar and you wrap it up to put it under the tree, addressed to your family or to the kids. With the calendar, you could type out a nice letter outlining the fun activities you plan to do. Examples could include skiing, a snowshoe tour, an afternoon at a resort tube park, a trip to the hot springs in Banff or passes for the Banff gondola, dinner out at a favourite restaurant, etc. If buying a trip for an extended family member (and you don't want to book the date for them,) ask the resort about purchasing a gift card. Alternately, I worked with my husband's parents the year they sent us to a backcountry ski lodge. We chose the dates together and surprised my husband with the present. 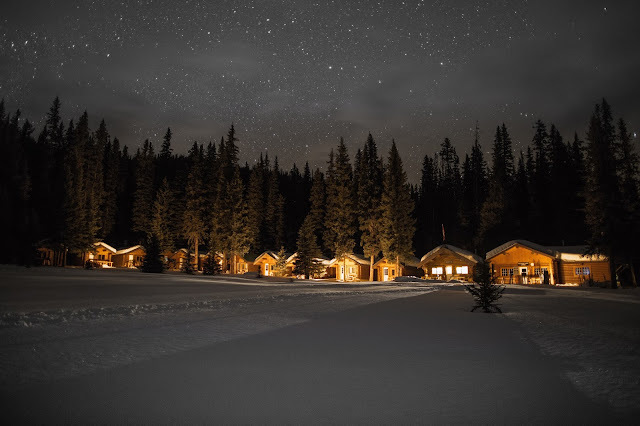 We LOVE the Delta Lodge at Kananaskis and it's positively magical during the winter with its skating rink, snowshoe and cross country ski trails right outside your door, sledding hill, sleigh rides, and proximity to the Nakiska Ski Area. The restaurants are family-friendly and affordable, and the swimming pool is worth a stay alone with its indoor/outdoor hot tub and eucalyptus infused steam room. To read more about winter at the Lodge, read my story from last winter: Ten Reasons to Spend Time at Kananaskis Village this Winter. Enter to WIN a one-night stay at the Delta Lodge at Kananaskis for your family this winter with breakfast included in the stay. Full details are at the bottom of this post where you can enter to win. There are a couple of different options for discount ski cards in the Canadian Rockies and most of them have to be purchased by the end of December. Most include multiple hills or resorts and qualify the card holder for free ski days along with discounted days. Most can also be upgraded for direct to lift access. Gift cards or actual lift tickets are other great gift ideas for the skier in your family. Invest in an RCR Rockies card, on sale until December 31st and get free skiing at four resorts (Nakiska, Fernie, Kimberley, and Kicking Horse) on your 1st, 4th and 7th days with discounts on the other days. Buy a card for each family member and wrap them up under the tree or put them in stockings. You can also buy lift passes for the RCR Resorts from Costco at a great discount or you can buy RCR gift cards (in $25, $50 and $100 denominations.) These make great Christmas presents wrapped up with a new toque or pair of ski gloves. And, the gift cards would be very useful if planning an afternoon at the Nakiska Tube Park. Finally, check the Deals and Packages section of the Nakiska website to find great specials on accommodation which often includes lift tickets. The RCR website also has a Vacations Tab where you can book a winter ski vacation for the family. Most companies will print you a voucher that you can wrap up to put under the Christmas tree. Otherwise, book the tour and mark the date on a calendar that you would wrap up (as with the travel suggestion above.) Alternately, you can usually buy gift cards for tour operators if you don't want to choose the date for an extended family member. Kananaskis Outfitters operates a small outdoor retail store out of Kananaskis Village and I can assure you it's a great place to stop if you've forgotten your ski pants at home while heading out for a day of skiing in Kananaskis. (and yes, that has happened to me.) I love stopping in at the store every time I'm at the Village and have been known to build my Christmas list after spending time browsing around the store. 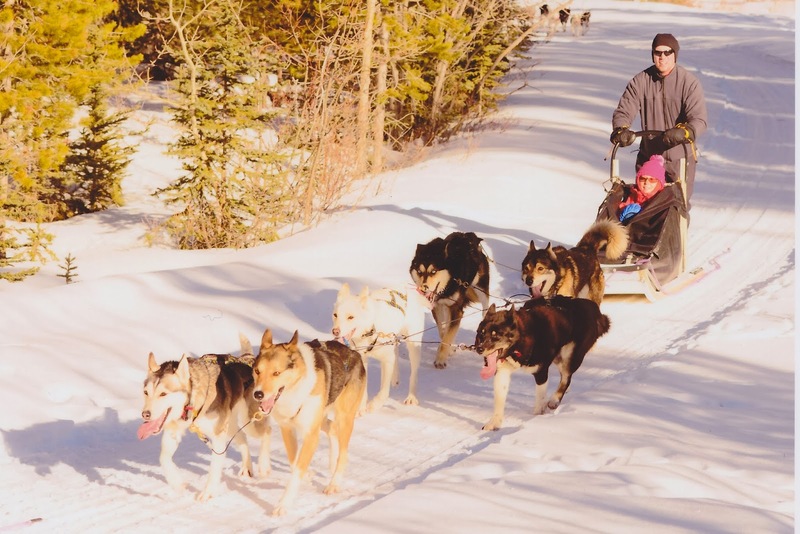 Finally they offer fat bike tours to a frozen waterfall, stargazing snowshoe fondue tours, full moon snowshoe fondue tours, and daytime snowshoe tours which are suitable for the whole family. Note that the evening snowshoe tours are best suited for adults or for children 12+. For full information on rentals and tours, please visit the Kananaskis Outfitters Website. Also read the story I wrote for Snowshoe Magazine last winter: Moonlight, Snow Angels, and Snowshoes. Enter to win two spaces on a Stargazing Snowshoe Tour from Kananaskis Outfitters. 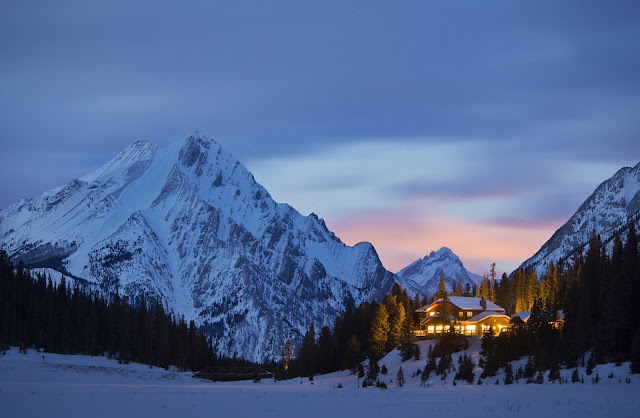 There are beautiful resorts located all over the Canadian Rockies and chances are, you know exactly which one your partner would like to stay at. I know it wouldn't take much for my husband to pick ten awesome resorts or backcountry lodges that he could take me to - with a guaranteed scream Christmas morning. Wanting to do this for your son and his wife? Or your daughter and her husband? Coordinate with one of them to pick dates and offer to take the kids for the weekend. (And yes, that's two gifts actually.) Alternately, surprise both parents and leave the trip open ended for dates. Give the couple a gift card/voucher for the resort or print out your own voucher with an IOU for the intended resort. Finally, this is a great gift to give to your own parents who "have everything," or who can't ever think of anything they want for Christmas. No babysitter? You can always take the kids with you. Less romantic I know, but many of the condos in Banff have one or two bedroom suites (so you can have some alone time) and a backcountry lodge is always romantic, with or without kids. Do you have an adventurous partner that you never quite know what to get for Christmas? Here are some ideas to get the ball rolling. Any Adventure tour your partner would love! (Think: The Via Ferrata at Mount Norquay or Kicking Horse Mt. Resort for next summer, a cave tour in Canmore's Rats Nest Cave (good all year long,) a dog sledding tour this winter, etc. A Backcountry Ski Tour makes for a great Christmas present! You shouldn't have problems thinking of an event your partner would like to go to over the next few months. The one that comes to my mind though is the Banff Mountain Film Festival World Tour. The Tour will be coming to Calgary from January 17th to the 30th. Tickets can be purchased on line or from MEC if you are in Calgary. Babysitting suggestion: coordinate with friends who also want to go see the film tour. Buy tickets on different nights so you can take turns watching each other's kids. My son has subscriptions to two magazines and he loves getting them in the mail. 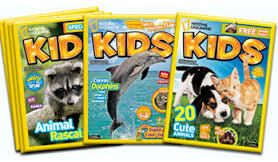 The ones I recommend for kids are the National Geographic Kids (or little kids) Magazine and Wild, which is published by the Canadian Wildlife Federation. And while you're at the Canadian Wildlife Federation's Website, consider adopting an animal for Christmas. Magazine subscriptions are great presents for the grandparents as well and ours regularly get a list of publications that the family wants. Enter to win a one-night stay at the Delta Lodge at Kananaskis in a standard guest room for you and your family this winter. Enter to win two lift tickets and two tube park tickets for Nakiska Ski Area. The tickets must be used by the end of the 2017 season and there are no blackout dates. The winner will be sent a certificate to use whenever he or she wishes this season. Enter to win two spaces on a stargazing snowshoe tour from Kananaskis Outfitters. The winner will receive a gift certificate so that they can book for the date of their choice this winter season, 2016-2017. Note that this is for a regular stargazing snowshoe tour and does not include a fondue tour. All Giveaways end on November 24th. A winner will be notified by the 25th. If I don't hear from the winner by November 28th, I will choose a new winner. Giveaways are open to anybody who will be able to visit Kananaskis this winter to use their vouchers. Winners must be 18 years of age or older. 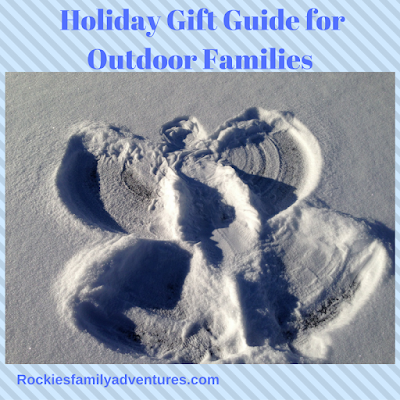 Tales of a Mountain Mama - Gift Guide to Help Get Outside 2016 + Giveaways! Loved this post. This looks like an amazing place to go to take the family to get away from the city and all the electronics. To really enjoy the outdoors! So many great giveaways here! My favourite family ski memory as well as the most beautiful place was our trip into Elizabeth Parker hut last winter, would love to return one day. If we to win the kananaskis stay we would go out for some cross country skiing and then enjoy the hot tub! Great competition! We started our Canadian adventures with a trip to the Delta (last year's Christmas present), would be great to go back! Skiing at Nakiska, fatbiking for my husband, and swim/hot tub for all! I have yet to ski anywhere that isn't beautiful. There is something about snow that is magical, everything looks magical. Blue skies are always an added bonus! Last year I took my 5 year old son on a ski trip (just the 2 of us) we skied 2 days at Norquay and spent the night in Canmore at a hotel and went to Elevation place. It was awesome! At the Delta Kananaskis we would go skating, make a snowman and relax in the hot tub! We stay as a family at the Delta annually! Great base in the mountains to x-country and downhill ski! Not to mention all the fun things to do onsite like tobagannijg, skating, swimming and snowshoeing! A perfect winter wonderland adventure! My favourite place to ski is Fernie. I love the large bowls and the small town feel. I learned to snowboard there and I've had some of the best powder days of my life at that resort. Wow! Great contests-the Delta Kananadkis was on our list this year-we went last year and we all loved it! I would love to stay at the Delta and do some skiing and skating from the lodge. We have never stayed before but have had a great intro to xcountry ski day at Pocaterra many years back with a friend. It was my first time on xcountry skis and the routes were great! Sadly it was pre-flood so I think the trails we skied have changed. We have yet to ski as a family but I'm hoping this winter it'll happen at the Nordic Centre! The Delta in Kananaskis is such an awesome property. We'd take in some snowshoeing in the area and be sure to spend time at the pool/hot tub/sauna (and I LOVE their eucalyptus steam room)! Maybe stretch this into a weekend adventure and use our Nakiska passes for a day on the slopes. We love the Delta and would so enjoy hiking and skiing in the area! My fav ski memory is just this past year, getting 2 of my 3 kids on skis. All 3 will be out this year! And the most beautiful place I have cross-country skied is tied... Canmore and Gatineau Park in Quebec. I like all the ideas for spending time together and creating memories. I was trying to come up with ideas for my extended family last night so this was perfect timing. I really like the idea of booking something and then putting it on a calendar and gifting the calendar. The Delta would be great to do some snowshoeing and to find a sledding hill! My favorite family skiing memories were as a child. It was so much fun when we reached the stage that all of us could ski together like 5 little ducks in a row! Another great post full of ideas for outdoor adventures. At the Delta, we'd squeeze in as much as possibly, both down hill and cross country skiing to say the least. I have so many great family ski memories, both from when I was a kid, and now the I have kids. One strong memory is waking up to giant cinnamon buns then heading to Lake Louise together. I would love to give the starlight snowshoe to my parents, my Mom would really enjoy it. So many beautiful, quiet places, I'd have to say backcountry skiing at Mosquito Creek just because that's where I got engaged. I've done a ton in the area but never stayed at the lodge before. 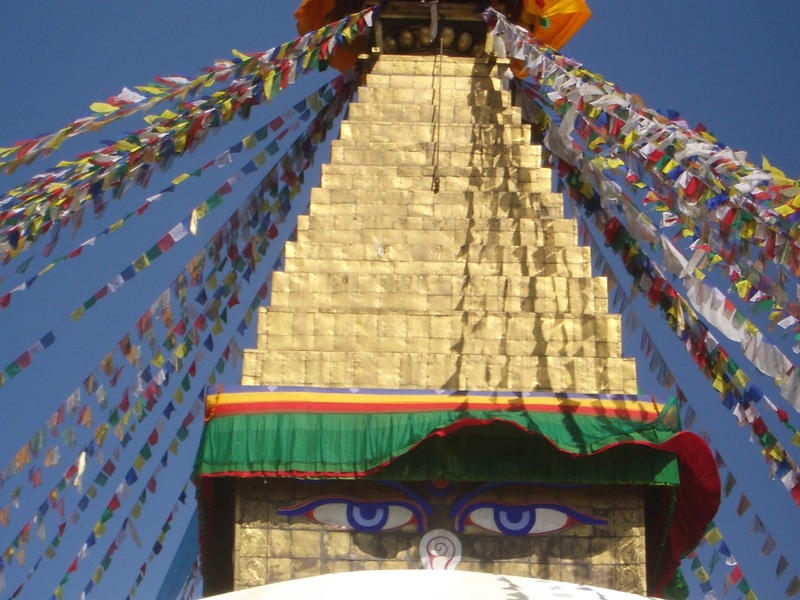 Great post as always Tanya! My family would love to spend some time in Kananaskis! We love everything out there! We would swim and skate and snowshoe, and who knows, maybe even try to get the kids out on Xcountry skis! My favourite ski memory was last year's trip to Kimberley with M, it was so fun to ski the entire mountain as a family. We would like to try it all. We're new to actually enjoying winter. We would skate,cross country ski, toboggan, hike to Troll Falls, maybe a day trip to ski/tube at Nakiska, and definitely chill in the pool and hot tub. I feel like the timing on this article was just right. I read the whole thing through, took notes, and made some plans! My favorite ski memory isn't even mine...it's family lore...when our super fun Aunt lost control on the bunny hill and plowed through the lineup for the tow rope! My list of skiing locations is short and I've never been snowshoeing, so I'll go with Cameron Lake in Waterton. Wow! What fantastic ideas! Thank you Tanya for putting them together and sharing links to other bloggers as well. My favourite ski memory is going with my siblings and learning for the first few times! We would wait on each other on the mountain to make sure everyone was ok! Lake louise is the most beautiful place to ski! A favorite skiing memory is Christmas break ski trips with left over turkey buns and stuffing for lunch. I would love to spend time playing in the snow and sledding! I have never gone skiing but would love too! I love being in Kananaskis country its the most beautiful place on earth! Love the 'isolation' of the Delta Lodge at Kananaskis - hikes and swimming are great! We've never stayed at the Delta but I've heard so many great things about it! I'd love to spend some time outside with my toddler and then relax in the hot tub. Thank you for the chance to win !!! Cross-country skiing and go for a skate on the lovely pond in the evening! My favourite ski memories are all related to quality time with my family - smiles, spending all day outside, the amazing photos my dad always took. Great ideas for some amazing family adventures this winter :) Thanks, Tanya!! Some great ideas. Thanks for the tips. My husband is always tough to buy for. One of these would be perfect! I would absolutely love to take the family out to Kananaskis to try snowshoeing for the first time - I can't imagine a better place to have that experience! Of course, we'd also love to spend some time tobogganing! :) Thanks for the wonderful giveaways! Everywhere in Alberta is absolutely beautiful for skiing! My personal favourite is Lake Louise, the views never fail to take my breath away! We've ever been in the winter but we enjoyed kayaking, paddle boarding and hiking in the summer. I suspect snow shoeing and Xcountry skiing would be our choices. If I won the stay at the Delta in K country, we'd definitely take advantage of their little skating pond! My fave ski memory is back when Wintergreen was a ski hill. It was my first time trying snowboarding. I had the most sore tailbone for weeks afterwards from falling so much, but it was such a blast! I would love a stay in Kananaskis that way my husband could join us! I love xc skiing when the trees are coated in snow and it looks like you are in a snow globe. Around the lake in Kananaskis. I would ski at Nakiska and xc ski! We will be staying at the Delta Kananaskis Lodge just before Christmas and I'm looking forward to hot chocolate around the tree with my kids and going on a moonlight snowshoe tour! This is our 3rd year skiing with our kids and watching the girls progress and being able to do all the runs with me and my husband is the best experience! Nakiska is my favourite place to ski! I'd love to just take the family out hiking in Kananaskis to enjoy all the beautiful scenery this winter! While staying at the Delta Lodge at Kananaskis I would go skating, snowshoeing, cross country skiing, stargazing, and go on sleigh rides with my family. I think snowshoeing is a great way for a family to enjoy to the clean mountain air! The most beautiful place I've gone snowshoeing is on Lake Louise during the holidays! This would be fantastic!! Thanks for the opportunity. We would do snowshoeing and we would like to experience dog sledding tour. We would definitely spend time in the hot tub.